There are a whole lot of options to watch the title game, including "a six quadrant viewing experience" of Voices on ESPNU. Five different Voices productions will air simultaneously on ESPNU (with sound jumping around location to location Red Zone-style), with individual feeds on ESPN3: The “Voices” shows have often produced some of the weirdest and most entertaining parts of the MegaCast, thanks to the likes of Jay Bilas, Teddy Atlas and Bill Walton. While those three haven’t been specifically named yet, there are still names to be announced, and there are some big names that have already been added to this year’s roster. And ESPN’s now doing this with five different shows with very different flavors. Here’s a look at the five on tap. NFL Live: Wendi Nix will host and be joined by former LSU safety Ryan Clark, Boston College quarterback Tim Hasselbeck and Pitt safety Louis Riddick from their traditional studio in Bristol, Conn.
ESPNU will feature all five shows and the game in a “a six quadrant viewing experience,” so viewers there will always be able to see all the feeds, but will have sound jump around from feed to feed. Those looking to watch one specific Voices production can do so through streaming options on ESPN3 and the ESPN app. Pat Fitzgerald, Mike Bobo and Kevin Sumlin (plus others to be announced) will be on the ESPNews Coaches’ Film Room: The regular Coaches’ Film Room has become one of the most popular segments of these broadcasts, with active or recently-active coaches discussing certain plays, players, coaches in the game and more. This year’s version will feature Northwestern coach Pat Fitzgerald, Colorado State coach (and former Georgia player and offensive coordinator) Mike Bobo, and former Texas A&M coach Kevin Sumlin. And “additional coaches will be added throughout the weekend.” Plus, there are limited commercial breaks on this broadcast, allowing the coaches to get in more points. Landon Collins and Aaron Murray will be on the Homers Telecast on ESPN2: The “Homers Telecast” is back for a third year, with former players from each school calling the game from field level alongside ESPN play-by-play analysts.. Former Alabama safety Landon Collins, now of the New York Giants (and of the “cancer” comments about teammate Eli Apple) will be the designated Crimson Tide homer, pairing with Joe Tessitore. Former Georgia quarterback Aaron Murray (who joined CBS as a college football analyst this season) will be the designated Bulldogs homer, pairing with Adam Amin. The Finebaum Film Room returns to SEC Network, with Greg McElroy and Gene Chizik: ESPN will again be providing a broadcast of Paul Finebaum watching the game and taking calls, which should be particularly entertaining given this all-SEC matchup. He’ll be joined by two regular SEC Network analysts, former Alabama quarterback Greg McElroy and former Auburn coach Gene Chizik. Chris Fowler, Kirk Herbstreit, Tom Rinaldi and Maria Taylor will call the main broadcast on ESPN: Fowler and Herbstreit are working their fourth-straight national championship, as is Rinaldi (who will be reporting on the Alabama sidelines). Taylor is making her national championship debut following her first season as the regular reporter for ABC primetime telecasts with Fowler and Herbstreit (she replaced Sam Ponder, who moved to NFL hosting duties). ESPN will have more than 110 cameras inside the new Mercedes-Benz Stadium, including utilizing more than 80 for the College Football Playoff National Championship. 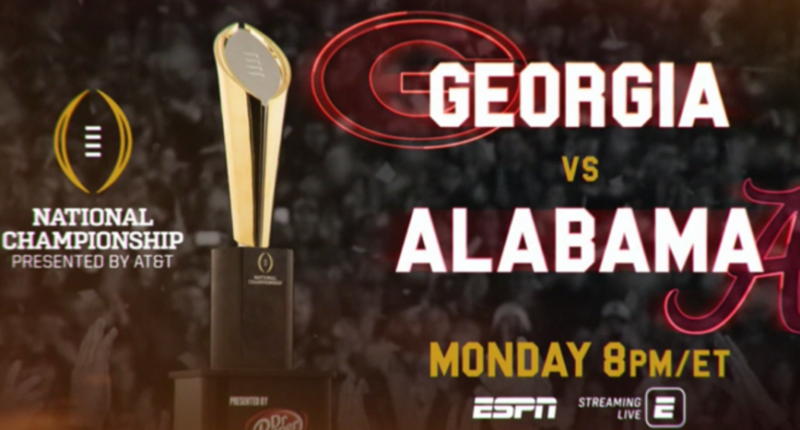 ESPN’s state-of-the-art production will feature two never-before-used camera angles for a national championship game: First-and-10 marker cam and the Dual SkyCam System. The first-and-10 cam is a camera inside the first down marker, providing viewers a look at the line to gain. ESPN first utilized the unique camera angle at the College Football Playoff Semifinal at the Allstate Sugar Bowl. The Dual SkyCam System uses a second SkyCam, positioned higher than the traditional SkyCam, providing viewers two different vantage points from, typically, behind-the-offense. Both of the SkyCam’s individual feeds will be available as part of the MegaCast production (see below). Pylon Cams: All eight pylons will be equipped with four cameras, allowing for camera angles along the goal line, sideline and backline. Inside the Locker Rooms: Cameras affixed inside the locker room anteroom area will provide unique access as Georgia and Alabama come-and-go from the field. Other broadcasts: ESPN Classic has a Sounds of the Game option again (no announcers, just in-stadium sound), while ESPN Goal Line will have “Command Center” (multiple camera feeds at once, which could include the main angle, the SkyCam angles, and the cameras dedicated to each head coach). Both of those options will also be streaming on ESPN3. And there are plenty of streaming-only options, including individual SkyCam feeds, hometown radio calls synced with the main broadcast’s visuals, an all-22 feed, and a “data center” feed with “On-screen graphic content ranging from analytics, real time drive charts, win probability updates, curated social media reaction and more.” That will include the ESPN Radio call from Sean McDonough, Todd Blackledge, Holly Rowe, and Ian Fitzsimmons, which is also available separately in the app. And ESPN Deportes and ESPN Deportes Radio will have Spanish-language broadcasts. Add it all up, and there are a whole ton of ways to watch this game.